I am happy to announce that the winner of Caption Contest 41 is ... John D! Congratulations to John, who wins a custom black and white illustration of whatever he likes (within reason). 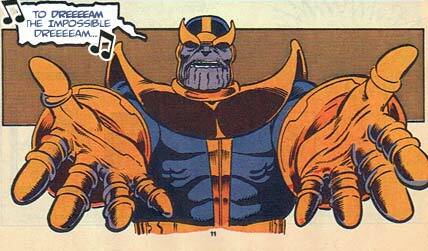 I had to truncate the lyrics a bit to fit the balloon, but I loved the idea of Thanos appearing in a musical. Maybe if he did that more often he wouldn't be so grumpy and bent on universal destruction, you know? Kaldath: Five … Five Dollar Foot Longs!! Ballin' Boy: You’re an angry elf! Rick: Ribbed… for your pleasure. I apparently love commercial references, obscure movie quotes, cookies, baby talk, and lewd allusions. Me in a nutshell, pretty much! Thanks to everyone who entered, and keep an eye out in a bit for Caption Contest 42 and YOUR chance to win a professional illustration! Thanks Jeff! “Man of La Mancha” has always been my favorite musical. Wow! i’ve gotten a few honorable mentions, but I’m excited.